Loveable teddies came in all shapes and sizes. For me the greatest teddy i owned looked about 10 feet tall as a 3 year old. As i grew up he seemed to shrink until i realised how small my “big teddy” really was at the age of 8, and he was shedding fur and had a dodgy eye. But i still loved him. 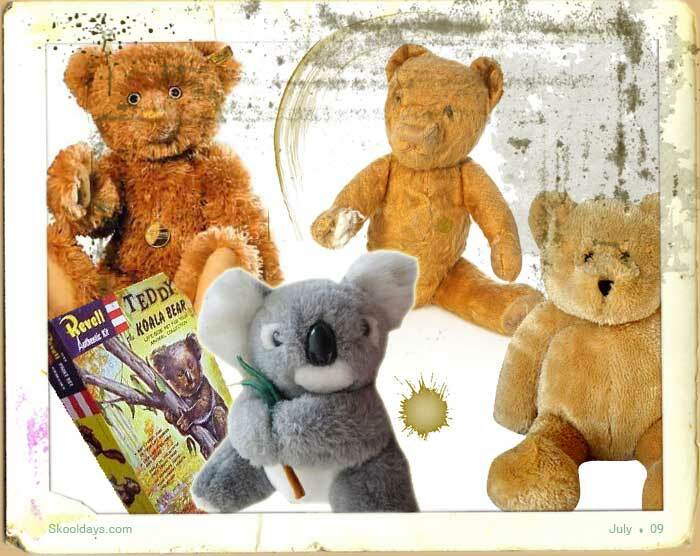 My other teddy was actually a Koala bear that was odd because he had a green paw on the left hand side. Years later i was educated that it wasnt a green paw but a leaf that i managed to demolish down to its stub as a baby. What are Teddy Bears ? So what defines a teddy bear? It is an enduring, traditional form of a stuffed animal, often serving the purpose of comforting children. In recent times, some teddy bears have become expensive collector’s items. The name Teddy Bear comes from former U.S. President Theodore Roosevelt, whose nickname was “Teddy”. The name originated from an incident on a bear-hunting trip in Mississippi in November 1902, to which Roosevelt was invited by Mississippi Governor. There were several other hunters competing, and most of them had already shot something. A suite of Roosevelt’s attendants, led by Holt Collier, cornered, clubbed, and tied an American Black Bear to a willow tree after a long exhausting chase with hounds. They called Roosevelt to the site and suggested that he should shoot it. He refused to shoot the bear himself, deeming this unsportsmanlike, but instructed that the bear be killed to put it out of its misery, and it became the topic of a political cartoon by Clifford Berryman in 1902. The cartoon of an adult black bear lassoed by a white handler disgusted Roosevelt, later issues of that cartoon made the bear smaller and cuter. Morris Michtom saw the drawing of Roosevelt and the bear cub and was inspired to create a new toy. He created a little stuffed bear cub and put it in his shop window with a sign that read ” Teddy bears ,” after sending the bear to Roosevelt and receiving permission to sell the bears. The toys were an immediate success and Michtom founded the Ideal Novelty and Toy Co., which still exists today. i’m looking for a specific teddy and i can’t find mention of it anywhere. i got one in 1994 for my birthday. It was a sitting up orange tiger (sitting up like a person or teddy, rather than an actual lion), and it had a white mane and beard, thin arms and legs, and blue cartoon eyes, of felt, rather than beads. don’t suppose anyone can help?